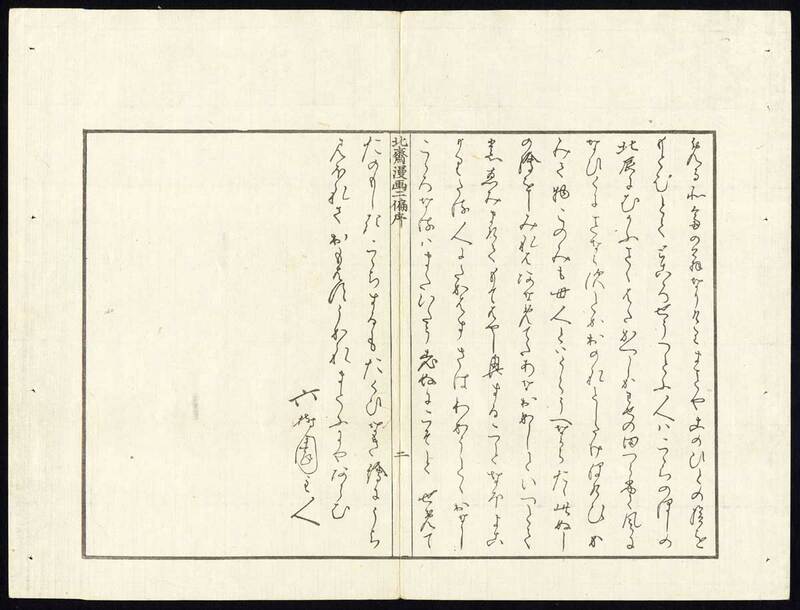 Subject: Sheet with 2 pages from a Japanese sketch / picture book with images that serve as drawing examples for artists. This sheet shows Japanese language. Age after 1814. Condition: Excellent. General age related toning. Original middle fold and small holes in margin as issued or from binding. Please study scan carefully. Medium: Woodblock print on hand laid japanese paper (washi). Size (in cm): The overall size is ca. 32 x 24.5 cm. The image size is ca. 26 x 17.5 cm. Size (in inch): The overall size is ca. 12.6 x 9.6 inch. The image size is ca. 10.2 x 6.9 inch. Description: While the general term for books written in Japan is Wahon / Wasobon, this woodblock print originates from an Ehon / E-hon (Old illustrated Japanese books.). The prints in these books are woodblock prints, similar to the separately published Japanese prints which are called Ukiyo-e (Prints of the non-eternal world.). Ehon books are often stitched in accordion folded pages. One of the most famous artists of Ukiyo-e prints and prints part of Ehon, is Katsushika Hokusai. This print originates from his 'Hokusai Manga' (Hokusai's Sketches. ), a collection of sketches of various subjects published from 1814 on. Artists and Engravers: The artist of these prints is Katsushika Hokusai (1760-1849), a reknown Japanese woodblock artist. He is most famous for his views of Mount Fuji. His most popular subjects are the Japanese daily life, traditions and legends. Hokosai was an inspiration for other famous artist as Ando Hiroshige.